Soffit & Fascia Jacksonville & Ponte Vedra FL | Enhancing Homes! While the soffit and fascia of your home provide a functional purpose, they are also important for creating a cohesive and attractive appearance for the exterior of your structure. When you need to replace or install soffit and fascia in Jacksonville, you can depend on Gutters & Covers LLC. With nearly 10 years of experience, we are able to provide functional solutions that will truly enhance the curb appeal of your home. With a variety of options, we offer soffit and fascia in Jacksonville that guarantee to meet all of your needs. From performance to appearance, our high-quality products and expert installation will surpass your expectations. 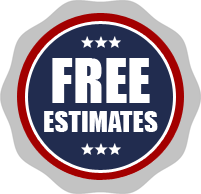 At Gutters & Covers LLC, we provide affordable replacements and installations for any home. Soffit is considered a critical part of your home's ventilation plan. Located on the underside of the overhanging eaves of your roof, soffit performs a number of practical functions needed to help protect your home from the effects of heat. 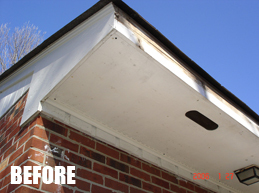 When your soffit in Jacksonville becomes damaged, it can lead to more extensive harm, such as roof and drywall damage. 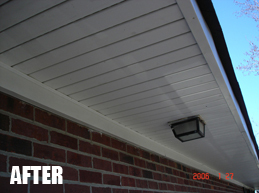 If you are considering installing new soffits, you should definitely consider adding fascia. Jacksonville homeowners often forget about this protective component of the roof. Located in between the shingles and soffits, this protective layer helps provide an air-tight seal between your home and its soffits. With fascia, your Jacksonville home will be one step closer to complete weather and water protection! For fascia installation in Jacksonville, you can count on Gutters & Covers LLC. With options like textured and traditional, you can achieve the performance and appearance you want from your new soffits and fascia. We install soffits and fascia for homes in Jacksonville, Ponte Vedra, St. Augustine, Orange Park, Jacksonville Beach, Atlantic Beach, Neptune Beach, Middleburg and Green Cove Springs, Florida. Contact Gutters & Covers today to learn more about our residential labor warranties!